If you've ever had trouble deciding between a tight-patterning long-range turkey load and a wide-spreading, close-range one, you're not alone. 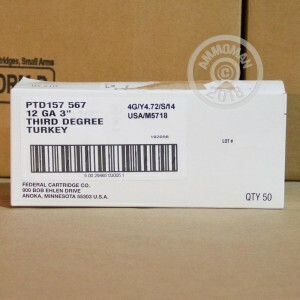 Enter Federal 3rd Degree Turkey 12 gauge shells, which are designed to perform equally well at a variety of ranges. 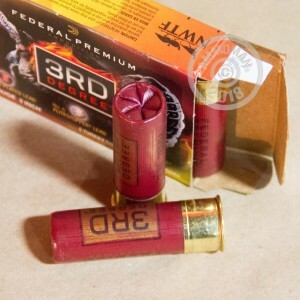 These 3" shells come in boxes of 5 and fire a blend of three shot sizes. 20% of the load consists of #6 Flitestopper pellets designed for close-range engagement. 40% consists of copper-plated #5 shot optimized for midrange performance; the remaining 40% is made up of Heavyweight #7 tungsten-iron pellets for reliable performance beyond 40 yards. This combination helps ensure that a reasonably well aimed shot will bag you a turkey, whether it's at 5 yards or 50! This ammunition is loaded in Anoka, Minnesota and uses the renowned Flitecontrol wad, a rear-opening design that provides better patterning than conventional wads. 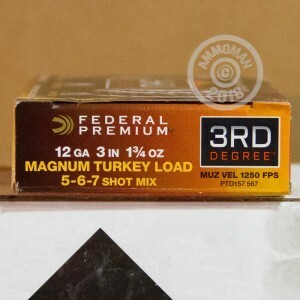 Federal donates a portion of the profits from this ammunition to the National Wild Turkey Federation.